Scarves can be an elegant or edgy addition to your window treatments. It is rather simple to execute, and you can choose from thousands of materials, patterns, colors and designs, which is probably the most difficult part of the process. If you already have scarves that you would like to drape on your windows, disregard the first step and just focus on hanging the fabric. Choose the scarves you want to use. You can go to an arts and crafts store to buy actual scarves, or you can purchase material and make a scarf yourself. Pick a color scheme, design and material that suits your home décor and is easy to clean. 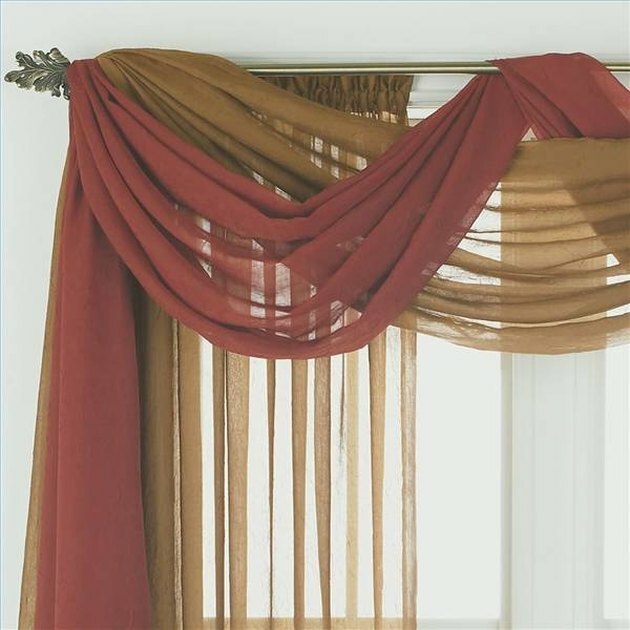 Decide whether you want the scarf to cover the whole window, or whether you're draping it to decorate the curtain rods. If you want to cover the whole window, you'll need a much wider piece of fabric. Trim the fabric to fit the window's proportions, if necessary. Make sure all the edges are straight, without frays that could pull and unravel the scarf. Lay the fabric on a flat surface such as a wooden floor, counter or large table. 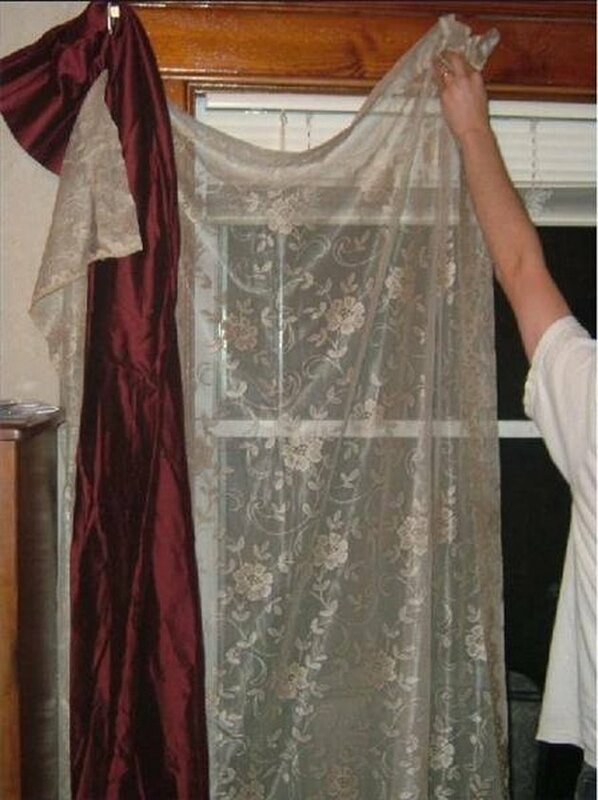 Imagine how you want your windows to look with the fabric. Do you want it to hang on the curtain rod and be the actual curtain, or do you want to fold it accordion-style on top? 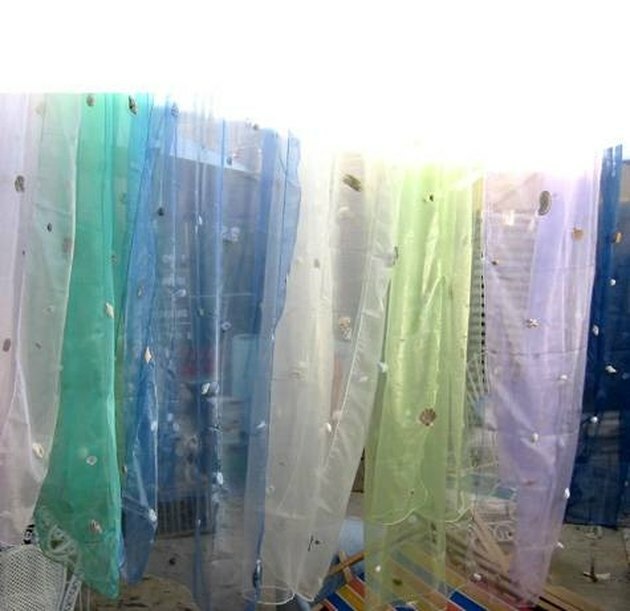 If you want it as the actual curtain, fold the fabric on top over 2 to 3 inches and sew using the needle and thread to make a pocket where you will insert to the curtain rod to make the curtains. For an accordion-style, lay the fabric on the flat surface and start folding the fabric lengthwise. Make each fold at least 2 inches wide and then pin in place with safety pins, working downward. Pick up the scarf after you fold it and climb the ladder so you are level with the curtain rod. Pin the scarf, using the push pins, in one place on either side of the curtain rod wall hooks. This will help secure it into place while you style it. Loop the fabric around the pole loosely or loop it through once or twice and let it fall. Alternatively, keep the fabric pinned in on each side and pin up the middle of the fabric, creating a valance effect. 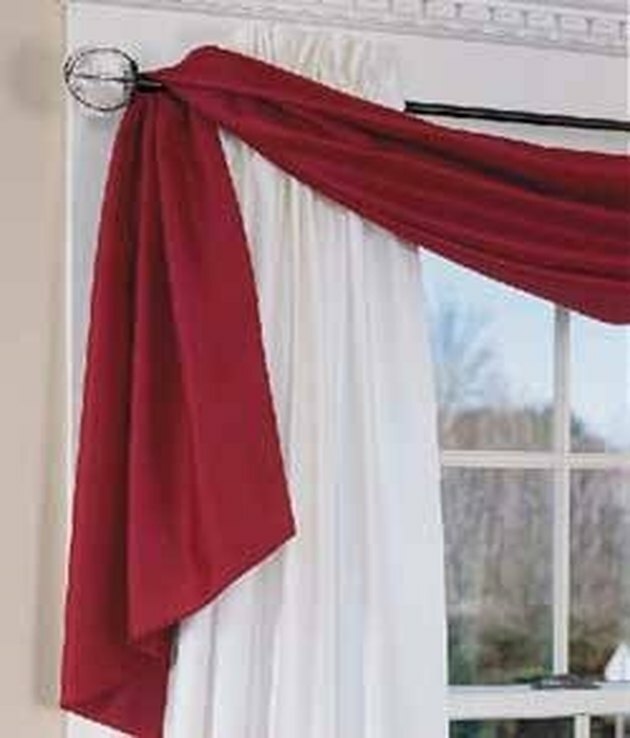 Or, drape the fabric all over the top of the curtain rod to give it natural waves so it falls lightly. Remove the safety pins from the accordion folds as you style each section. Make sure that the scarf is secured onto the wall or curtain rod. Dust regularly.